Welcome to the Mongol Diaries series by Benny D. These blog posts showcase Benny D’s journey from London to Mongolia as part of the legendary Mongol Rally. 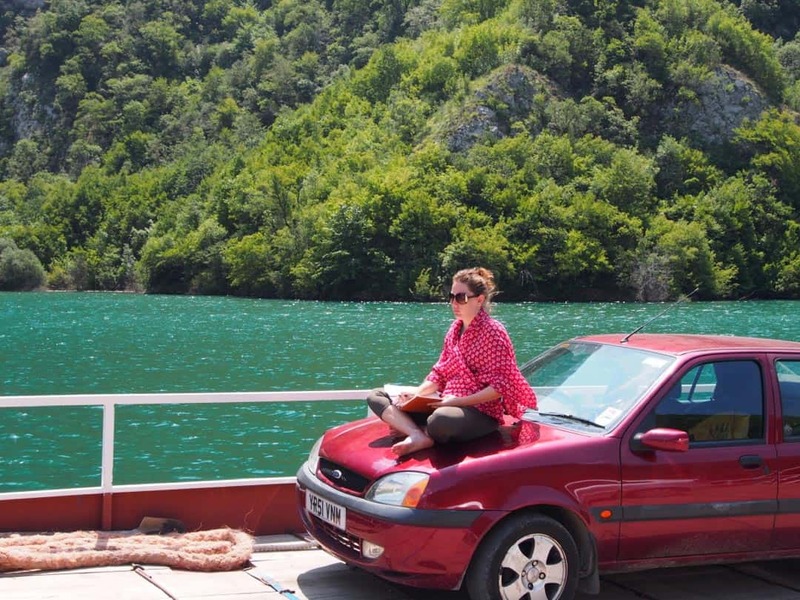 Ms Pennie catching up on her diary amongst the fjords of Lake Komani, Albania. I like to go to new and interesting places and immerse myself as much as I can through interaction with the locals, eating the cuisine and hopefully establish connections. But rather than sit down to a full meal of my destination of choice, this trip is more like a tapas plate of the countries of Europe and Central Asia. We only get fleeting impressions of the places we are passing through and its probably unfair to label it as anything- as your impression is influenced by not only what you see but with whom you interact. The more popular western European countries have largely lived up to their postcard stereotypes but as we move further away from them I find myself being pleasantly surprised by the places that I know little about. The whole point of the Mongol Rally (which I have pondered a lot recently) is to put the challenge to yourself and then find ways to overcome the obstacles that are put in your way. Something that sometimes we forget is essential for growth. You cannot find new ways to do things if you never try and you cannot learn by never making mistakes. I have encountered a range of challenges in this first week and apart from the objective of covering a massive distance in a short space of time, there are the day to day challenges like language and cultural barriers and coming to terms of agreement between each other about things like when and where to stop/eat/sleep and logistics of the fastest and safest route. After landing it was straight on to Italy through beautiful Swiss country side. We’ve tried to charge a phone plugged into the 12V port of the car but it doesn’t seem to be putting any charge into the phone. As we need the phone for all our navigation this is going to be an ongoing concern, along with a few other things. In order of priority – the radio is locked and is asking us for a four digit code. No music for 10,000 miles will be torture. Driving over the cobblestones of Milan its apparent that the rear suspension of our trusty chariot is completely shot. The spare tyre is currently fitted to the rear left and there is a flat tyre sitting in the back seat. Every wheel has a lock nut fitted to it and there appears to be no key for the lock nut anywhere. After two days driving we both have truck drivers sunburned right arm and neck and the weather is getting hotter. So there are some things you can do nothing about but the ones that I can attend to need urgent attention. For this first portion of the trip I was consistently amazed by the change in scenery as soon as you cross a border. Slovenia, Croatia and briefly Bosnia via about 60 euros in road tolls and summer tourists are buzzing around everywhere in the discount location of Montenegro and the town of Budva is pumping. Our guesthouse is well out of town but clean and cheap. Next day is supposed to be a bit of a rest day but we spend most of it at a garage getting the essentials sorted on the car. Lock nuts off, Spare fixed and an oil and filter change. Unfortunately, after removing the radio our trusty mechanic tells us he has the code for our locked radio but because we have tried the code 10 times he cannot fix it. Tuneless, our next destination is the Albanian village of Koman. From here we will take the car Ferry along the very picturesque lake to Fierze after a night in Rozafa hotel, right on the pier from where the ferry leaves. Kosovo, Macedonia and then we traverse the width of the country of Greece only stopping for lunch and a swim in Alexandropolous. A most excellent meal too of the freshest seafood before charging on without hesitation to Turkey, the recent subject of a political coup and terrorist bombings in the capital Ankara and Istanbul respectively. After sleeping in a different country every night and some days crossing multiple nations its time to move into territory that’s considered the imaginary line between east and west, the end of traditional Europe and the gateway to Asia.